Ever wonder about the life of a young Victorian chimney sweep? Jonathan Auxier is winner of this year’s Governor General’s Award for Literature for Young People (Text), for his enchanting novel Sweep: The Story of a Girl and Her Monster. The peer assessment committee says “A tender story of what makes us human, Sweep doesn’t shy away from the risks of love and monstrousness of indifference. With an impeccable narrative, Sweep shows how love can breathe life into darkness and how hope can spark change. Auxier weaves a multi-layered masterpiece with endearing characters and gut-wrenching twists that are certain to instill readers with a sense of wonder and discovery for the miracle of storytelling." Jonathan Auxier writes strange stories for strange children. His debut novel, Peter Nimble and His Fantastic Eyes was a Manitoba Young Readers' Choice Award Honour Book, and was also shortlisted for both the Monica Hughes Award for Science Fiction and Fantasy, and the Diamond Willow Award. His New York Times Best Seller The Night Gardener was a finalist for a Governor General's Literary Award, as well as winner of the Silver Birch Award, Monica Hughes Award, the TD Bank Children’s Literature Award, and the Canadian Library Association’s Book of the Year Award. 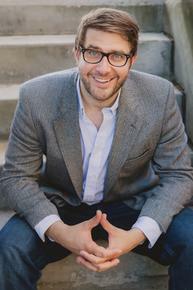 His third book, Sophie Quire and the Last Storyguard, won the Sunburst Fantasy Award. Auxier grew up near Vancouver and now lives in Pittsburgh with his family and their adorable pet umbrella. Trevor Corkum: Congrats on your Governor General’s Award, Jonathan. How does it feel to be recognized in this way by your peers? Jonathan Auxier: It is truly a dream come true! Canada has such a rich literary legacy, and the thought that Sweep has been recognized in this way is both humbling and thrilling! 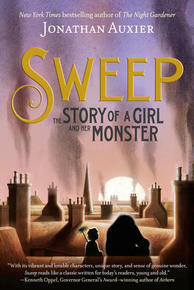 TC: Sweep tells the compelling story of eleven-year old Nan Sparrow, an expert chimney sweep living in Victorian London. How did the story come to be? JA: My fascination with chimney sweeps was first sparked when I read Charles Kingsley’s The Water Babies—which many people consider to be the first ever modern children’s novel. The book is strange and silly and doesn’t hold up terribly well … but its early chapters include a riveting account of the way chimney sweeps used children (called “climbing boys”) to clean chimneys. I was so shocked at the casual horrors of the job that I started to research climbing boys … and I discovered that the truth was even worse than I feared! It was while studying the real-life struggles of these children that Nan Sparrow first entered my imagination. TC: Were there any particular challenges in creating the character of Nan? JA: Sweep is very much an exploration of how one keeps a capacity for wonder even in hopeless circumstances. As I hinted above, the backdrop of Nan’s story is incredibly bleak … which made finding that wonder a challenge. Early drafts of the book were incredibly dark, especially in the opening chapters, and I had to spend a lot of time trying to find ways to let some light shine in through the cracks. Sweep is very much an exploration of how one keeps a capacity for wonder even in hopeless circumstances. TC: What’s your own litmus test for great storytelling? JA: I love stories that presume that the reader is smart (or at least hard working). I enjoy being forced to keep up with a plot and characters that are several steps ahead of me … It’s impossible to be bored when you’re breaking a sweat! JA: Robertson Davies is one of my all time favourite authors, and I’m always re-reading Fifth Business, which has lived on my night stand for the better part of two decades. As for more contemporary Canadian authors, I am a gigantic fan of Kenneth Oppel—he manages to astonish me with every new story. Right now, I’m happily devouring his brand new book, Inkling! There are all sorts of wonderful things a person might see very early in the morning. You might see your parents sleeping. You might see an ambitious bird catching a worm. You might see an unclaimed penny on the sidewalk or the first rays of dawn. And if you are very, very lucky, you might even catch a glimpse of the girl and her Sweep. With brush and pail and soot and song! A sweep brings luck all season long! The song is not particularly special. Their voices are not particularly sweet. But when they sing, the most unusual thing happens. Instead of people snapping their windows shut to block out the sound, they rise from their beds, one by one, throw back the curtains, and decide to love the world just a little bit more. Parents suddenly feel the urge to hug their children. Children suddenly feel the urge to let them. And every person, young and old, spends the rest of the day softly humming the song of the girl and her Sweep. For as long as the girl could remember, the Sweep had been at her side. First he carried her in a sling over his back and fed her bottles of milk. When she got a bit older, he would let her ride upon his shoulders and pick apples from the trees they passed. And when she got older yet, they walked together like true equals. The Sweep shared everything with the girl. If he had a scarf, he would let her wear it during the cold days and take it for himself on the hot ones. If they found a loaf of bread, the girl would eat half and pass the rest to the Sweep; he would eat half of what remained and then give it back to the girl; then she would eat half again; and so on. They would trade the loaf back and forth like this until the bread was gone and their bellies were full. The Sweep let the girl share in his work, too. First he just had her scoop ashes from the hearth, but when the girl became a bit stronger, he let her climb chimneys with him. From the start, the girl was a natural climber. She had long limbs, just like the Sweep, and her thin frame could wriggle through even the tiniest flues. Being inside a chimney is a frightening thing; it’s so dark and cramped that one can scarcely tell which way is up. And so when the girl and her Sweep climbed inside a chimney, they would sing to each other. The Sweep, who always went up first, would brush out soot and nests and cobwebs, singing all the while. And the girl knew that all she had to do was follow his voice and she would be safe. Eventually the two of them would emerge from the top of the flue, filthy and triumphant. The view from a chimney stack is a truly majestic thing. For miles in every direction all you can see are rooftops and more rooftops, like tiny dunes stretching to the horizon. Many times the Sweep remarked that kings and lords couldn’t wish for a better view—and that he should know, because he had swept a few palaces in his day. Of course, life was not always easy for the girl and her Sweep. Many nights were cold and wet. Many days were humid and hungry. More than once they entered a new town and quickly found themselves surrounded by a band of disgruntled local sweeps. Whenever this happened, the Sweep would ask the girl to watch the tools while he and the other sweeps talked things through in the alley. He would emerge a few minutes later, limping slightly, his clothes a little torn, but smiling as broadly as ever. He would report to the girl that the other sweeps had told him of a neighborhood just a few miles off with some particularly good houses. In thanks for this valuable information, he had decided to give them all the money in his pockets. When the Sweep did secure work, he would get paid a coin or sometimes even two coins. On his way out the door, he would always warn the homeowner to burn the chimney hot all night long—just in case any sparrows tried to make a nest up there. (This was a special joke between the girl and the Sweep, and it was all the girl could do not to spoil things by laughing.) Later that night, once the sun had set and the town was asleep, they would return to the same house, and the girl would clamber up the rain gutter to the edge of the roof and let down a rope for the Sweep to follow after her. Then, walking very carefully, so as not to make any noise, they would lay blankets against the smoking chimney stack, which was warm to the touch, and make their beds. Most children despise bedtime and will do anything to avoid it. This is because they are forced to sleep under scratchy covers inside stifling houses. If they could sleep like the girl and her Sweep—on warm rooftops beneath a canopy of stars—they would understand just how magical bedtime could be. And as the Sweep sang these words, the girl would drift off—dreaming of stars and seas and adventures far, far away. This was life as the girl knew it. And every night she slept soundly, knowing that she and the Sweep would have each other forever.